Spring has sprung and the time has come to step out of doors! Time to shake off the winter doldrums and try out new projects! Time to BUILD STUFF WITH YOUR KIDS!!! Then we saw a cub scout trebuchet. If you don’t know, a trebuchet is a middle ages siege weapon using counterweights and a long sling to hurl flaming rocks upon and past city walls. It was the epitome of siege weaponry, but it is kind of esoteric today. My son asked what it was and told him it was a kind of catapult. Research began. While a trebuchet is cool, it doesn’t SCREAM “catapult” like the traditional torsion mangonel (what you think of when you picture a catapult). You know it: An arm with a spoon or bucket on one end, they crank it down, then release it to slam against a big triangular backstop, unleashing hell downrange. There’s a whole online community that builds and plays with these things. After looking at enough pictures, I had a fair idea how one is put together. Since it was too late to start cutting wood, we hauled out the next best thing: fishing line and an erector set. And it worked pretty damn well too! It could fling Lego blocks all the way across the room. If you are not in the know, there are a number of things that go under the name “catapult.” Many home built ones now use bungees and/or surgical tubing for their action. This is fine, but not very traditional. Siege forces simply didn’t have access to elastic materials beyond simple springs and wooden bows. That would make a “tension” catapult. What they did have was natural twisted rope and sinew, which is not very stretchy. Instead of using moments of elasticity, they used “torsion,” energy built up in the twisting of said rope. The model above is a plastic erector model using twisted fishing line to provide that motive force. For the larger version, I did more research after Dylan went to bed. It seems that the spoon or bucket on the throwing arm is — while ubiquitous — not very historically accurate and mostly based upon misinterpretations of old plans. They were used, but they suffered compared to the Roman onager design. 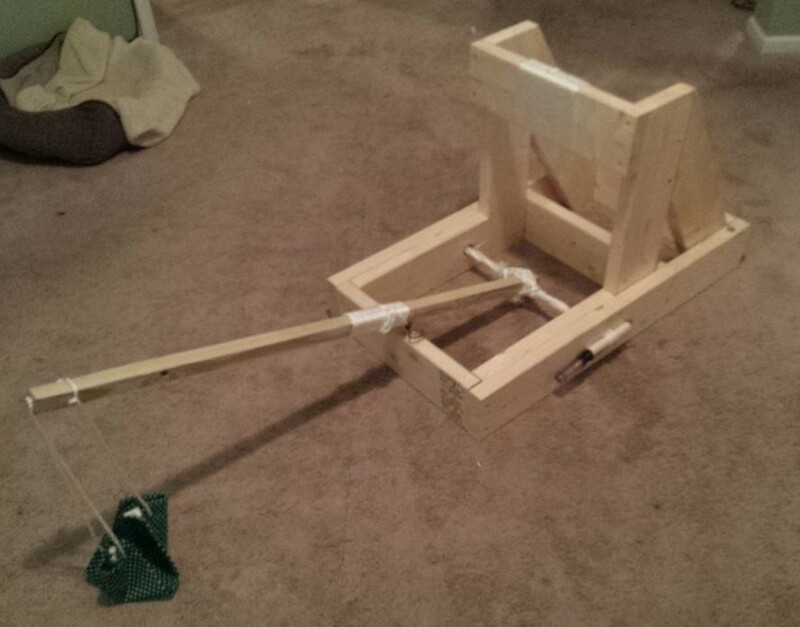 It’s the same torsion catapult, but it mixes in the sling from the giant trebuchets. The sling allows for the arm to travel further before it hits the backstop (rather than stopping at a 45 degree angle, it can go all the way to the uprights), and adds extra length for the throw. The trickiest part was making the diagonal braces with my atrophied trig. But, the numbers worked out and they fit in like a glove. In actuality, the frame is FAR stronger than any conceivable pressure the throwing arm or the torsion bundle could bear upon it, so I anticipate a lot of tinkering before it is optimized. As it is, the inaugural launch went pretty well. Our Roman onager, named “Scorpion,” can fling racquetballs about 20 yds, with the potential to go much further. Our limiting factor right now is the PVC pipes holding the torsion bundle in place. There was so much pressure on them, they pretty much bent in half, preventing further twisting and giving up a lot of tension. I’ll be upgrading to steel pipes next. The guys that do this a lot use curved steel plates, but the old designs used thick arches of wood or metal. The nylon rope and frame could absolutely stand more pressure. We also might try a lighter throwing arm and a longer sling. And, suffice it to say, I get all the “Cool Dad” points for the neighborhood. 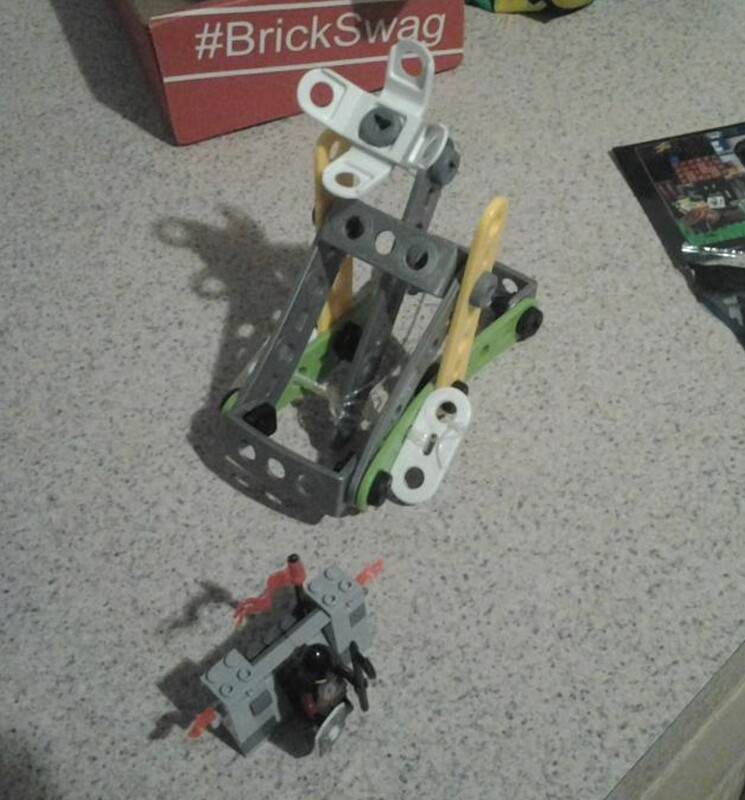 This entry was tagged backyard, catapult, Dylan, erector set, Lego, mangonel, onager, projects, Roman, Siege engine, Spring, torsion, trebuchet, woodworking. Bookmark the permalink. ← On My Way to MADICON!!! next project, try a repeating Chinese crossbow! I never had much luck with tools, a complete klutz. In college, a required class for ALL engineering students was on basic and advanced power tools, routers drills, etc. Term project was to build a 3 inch cube out of half a different thickness sheets of several different metals, using a wide variety of nuts, screws and other fasteners. Supposed to have a mirror finish. The prof looked at my “tinker toy” and cracked up laughing. Rest of the class also, He asked what type of engineering, I said electrical, and he said “Thank God” and gave me a B. Interesting. I’ve always thought of trebuchet as an upgrade to catapult. But if you insist catapult screams ‘cool’ louder, I won’t go slinging stones at you.